The Himalayas is the heaven for the trek lovers. All the regions and the ranges of the Himalayas are famous for trekking and camping. During the season, it is bliss to view the ranges covered with the trekkers who come here to conquer and live the hiking expeditions. The feeling of being on the top and viewing the Mother Earth from the highest point is a bliss of nature. There could be no view more spectacular than this. Ever wanted to be at such a place? 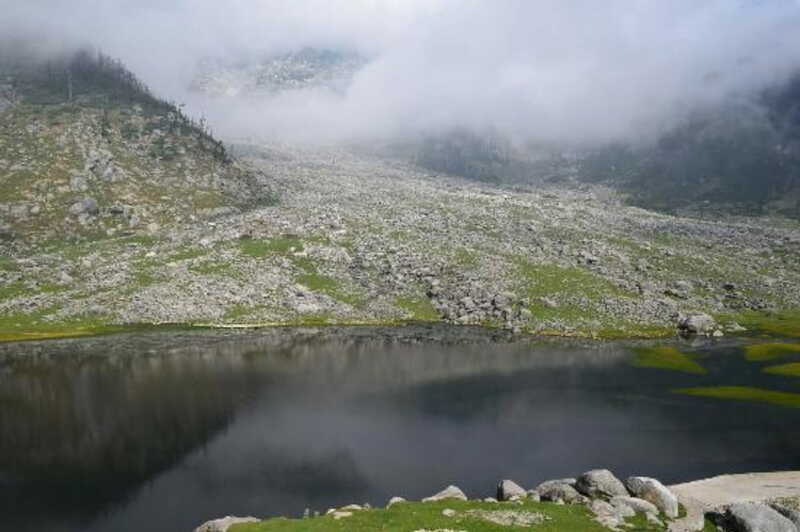 The Kareri Lake is one of the most popular treks in the Himalayas. It falls in the Dhauladhar range and is one of the best treks in India. The difficulty level of the trek is easy to moderate which means it is a good news for the beginners to go and try this heavenly trek. It is at an elevation of 3000 meters and the new route which it follows is through the Khauli valley. The Lake overlooks the Shiva temple which is the most popular attraction of the place. The trek starts from the Salli village and it follows the River Khauli. Though this route is quite not popular and the trekkers take the Daled camp route which is safer in some sense. If you got excited about this trek, let’s get into the details. The Kareri Lake trek through the Khauli valley follows the Daled camp route and starts from the Salli village. The trek from this route is of three days. The trails include lush green meadows and mountains, thick forests, streams, rivers, alpine views, and valleys. The trek is not a difficult one and the beginners can go for it. The trek is quite adventurous and the trekkers will come across a lot of Himalayan birds and animal species which are rarely seen elsewhere. The Khauli valley route is the shortest route which is taken by the trekkers to complete this trek. Camping overnight is a fun activity while being on this adventurous trek. The Kareri Lake trek falls in the Dhauladhar region of the Himalayas. The Lake lies just below the Minkiani peak. This trek starts from the Salli village and this could be called as the base camp of this trek. The village is well connected by the roadways so the trekkers could hire either the private transport or take the public transport and reach the base camp. Have sumptuous breakfast at the Salli village and start the trek for the Daled camp. The trekkers would reach there by the lunchtime. So, you will be having your lunch there and experiencing the most spectacular views of the Dhauladhar range. The trekkers would be spending the day here and enjoying a good time in their tents with evening snacks, dinner, and bonfire. The distance is 5 km and it will take approximately 10 hours to complete and the elevation is 2850 meters. The trekkers have to climb this trek after breakfast. After enjoying a good time at the Kareri Lake, you will be coming back for the lunch at the Daled camp and enjoy a leisure and a comfortable evening in your tents. The distance is 6 km and the elevation is 3300 meters. The third day the trekkers would have to return down to the Salli village which was the base camp. You will be moving down after having your breakfast. After reaching the Salli village, you will be exploring the market and having the lunch at the base camp. The trek ends here on the third day. It would take around 6 hours to trek down. The difficulty level of this trek is easy to moderate. So this means that the beginners could also go on this trek. The weather of the Kareri Lake is quite chilly. The temperature remains till 18 to 20 degree Centigrade in the daytime and drops down to around 5 to 6degree Centigrade in the night. 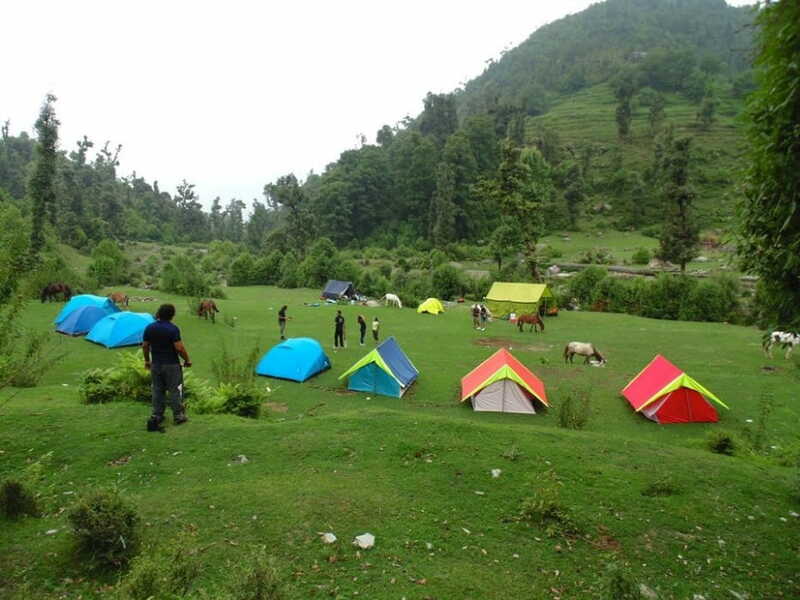 The trekkers would be spending the nights in the tents and enjoy the camping time. Simple and healthy tasty meal would be provided to the trekkers. The package includes all breakfast, lunch, and dinner. During the trekking expedition, packed food will be given which will be of good quality. There would be no compromise on the quality of the food. Transportation during the Kareri Lake trek. Camping equipment like the tents, sleeping bags and the sleeping mats. Guide, helper, cook and the other required staff. Forest entry charges and all the necessary charges and permit fees while going on Kareri Lake hiking. Meals and first aid kit while being on the Kareri Lake trek through the Khauli valley. Mules and porters for carrying the camping luggage of about 10 kg per person only when the Kareri Lake hiking has started. Mountaineering qualified and the professional trekkers who have ample knowledge of the Himalayan camp and who have the best Khauli valley trek reviews. The first aid basic kit is available for the trekkers along with the portal oxygen. It is really important during the Himalayan camp for the Khauli valley temperature. Personal Expenses and also the personal porters for personal use to cover the Khauli valley height. Transport to and from the starting point. Insurance of any kind for this Kareri Lake trek route through Khauli valley. The last ATM point and the last area to receive the phone connectivity before starting the Kareri Lake trek is at the Salli village. If the trekkers have to withdraw the money for the emergency use then this is the last accessible spot. The phone connectivity is the best till you reach this village and after that, the phone's connectivity will be lost or start getting weaker. 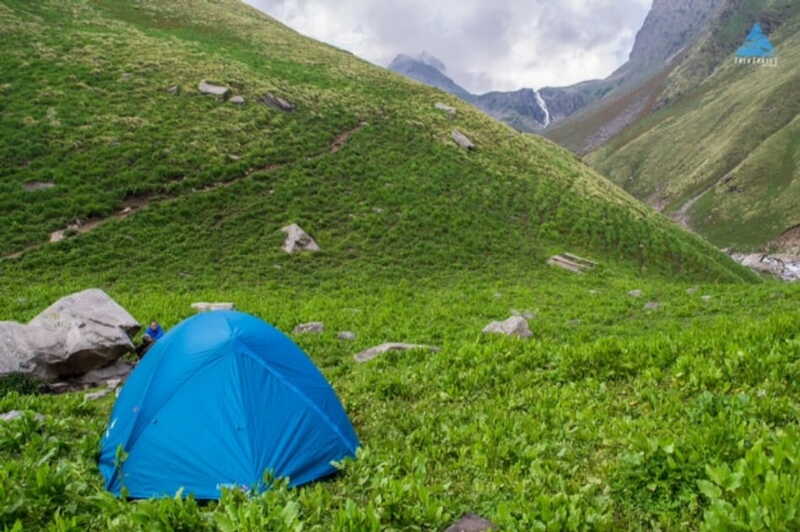 It will be extremely difficult for you to get any minor phone connectivity too from Salli village to the final Kareri Lake trek destination. We recommend you to make all the important calls while you are here before going to trek the Himalayas. As you start going further with the Khauli village height, the phone's connectivity gets weaker. Before going to trek the Himalayas and before entering the Kareri Lake hiking camp, you need to take permission and the permit of the Indian Mountaineering Foundation (IMF) to let your Himalaya trekking expedition go smooth. All costs of permissions/permits are included in the package. 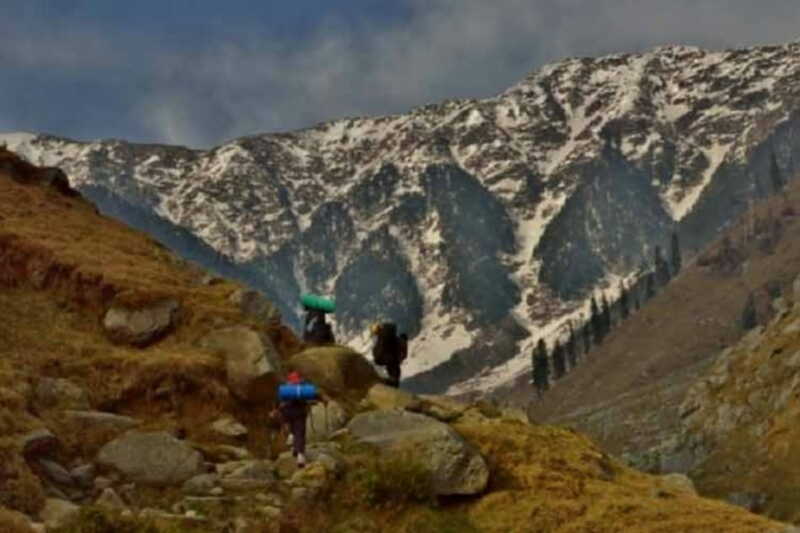 Backpack with all your necessities to cross this entire Kareri Lake trek distance through the Khauli valley. A rain cover because you cannot predict the Khauli Pass temperature. Water bottles and all your refreshments which include all sorts of hydration packs which you prefer. Snacks like the energy bars and the protein bars which would give you instant energy during the Kareri Lake trek route through Khauli valley. Personal Medical Kit with all the necessary first aid items and medicines which you feel you will need. It is always advisable to take medicines for dizziness, upset stomach, headache, and cold and cough while being in Himalayan camps or anywhere. Pack your outfits with all the relatable clothing items like wind and waterproof jackets, t-shirts, track pants, thermal inners, trekking shoes and fleece jackets. All the necessary winter outfits for the winter treks. All the toiletries products in a bag because you will need them the most. Also do not forget to take your extra accessories like the sunglasses, caps, gloves, walking stick, torch, and similar other items. You must avoid the sports shoes, jeans, and shorts while going to the Himalayan camp. It is always better to stick to the trek pants and the joggers.